The flowers the Vulcan Magnolia are large and fragrant and a wonderful ‘lipstick’ red (see picture right). Magnolia Vulcan is another that could be grown in a large container if required. A sunny position with around 6 hours of san a day which offers some protection from strong winds especially if you want the flowers to hold form for as long as possible. A good idea to stake when young. When planting water in well with some liquid seaweed fertiliser. Mulch well to maintain a cool root run and retain moisture during summer. 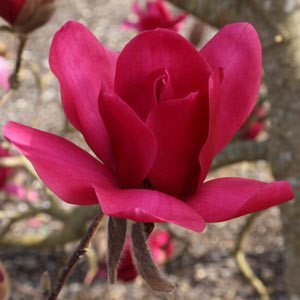 Pruning deciduous magnolias is not generally required and Black Tulip Magnolia is no exception, remove any damaged branches and any that detract from the shape, generally not pruning is required at all. A general purpose fertiliser can be applied in spring should be adequate in most areas, a good time to renew mulch as well, water well before and after applying fertiliser to your Black Tulip Magnolia.